When was the last time you crushed it? We’ve all been there: attending the same class, at the same time, with the same instructor... for months on end. After a certain point our bodies plateau and we stop seeing results or start making excuses not to go. But if you’re lucky, you’ve also experienced the feeling of crushing a goal: making it to the top of a summit and throwing your hands overhead; stepping into the street after a great workout and feeling invincible. Feeling proud, elated and electrified. CrushCamp was born out of that feeling. You don’t have to be a professional athlete to feel like one. And you don’t have to give up everything you love to feel amazing in your own skin. When you step into CrushCamp, negativity is checked at the door and your only competition is yourself. You will accomplish goals you didn’t know to be possible. You will strengthen your muscles, your heart and your confidence. You will leave knowing you can accomplish anything- because you just did. The signature CrushCamp format is a 50-minute High Intensity Interval Training (HIIT) class designed to maximize your caloric burn by giving you a balanced, full-body strength and cardiovascular workout. Weights, speed, and resistance are customized based on ability and fitness levels, making classes suitable for every age and ability. No two workouts are ever the same- meaning no boredom, no burnout and no plateaus. CrushCamp is proud to be the first studio in Canada to offer group training on the SkillMill: a non-motorized treadmill designed to train Olympic athletes. The curvature cushions your foot while encouraging proper running form, reducing impact to your joints. The non-motorized technology means that the speed is controlled by how fast you run. When you stop, the belt stops. The SkillMill also includes a unique resistance shift feature which allows you to quickly switch from resistance-free running to an all-out sled push. You can learn more about the SkillMill here. All of our coaches are AFLCA or CanFitPro certified. 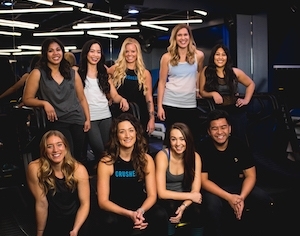 Your CrushCamp team is comprised of some of the best leaders, personal trainers, athletes and friends from our community. Safety and injury prevention are important to us. We promise that you will always leave the studio feeling better, stronger and happier than when you walked in. You can meet the team here.